was also Callaghan who probably made the most accurate partial assessment of pfnz when he called it “this crazy idea of getting rid of these animals for good from the (New Zealand) mainland was worth a go as it just might work”. To which we could add that on the basis of high failure rate for the smaller island eradications, it is more likely it just might not! With the push of Callaghan’s involvement the whole thing seemed to gather pace. In Feburary 2012, Forest &Bird organised and sponsored a meeting at Ruapehu of scientists who, smelling enhanced career opportunities, concurred with Callaghan’s conclusions. A further meeting was held in Gisborne, chaired by Gareth Morgan and reported in the Gisborne Herald on 11/6/12. There has also been a scoping document prepared by Landcare Research and DoC in May, 2012. This was called “pest free new zealand” and added as predators vegetarian deer chamois and tahr; in effect all non-native wildlife not behind wire for the purposes of farming are “pests” or predators to be eradicated.A conservation management model like New Zealand’s, which is in denial of the origins and evolution of its environment, needs a lot of money. After all, it is fighting nature, and nature will keep trying to come back. For this reason, embracing corporate funding is almost necessary to maintain an unworkable programme and, in this context, pfnz would seem like a manna from heaven concept to the nations conservation managers. The DoC and Landcare Research scoping paper by Andrea Byrom and Susan Timmins estimates the costs for the whole project to be around $27 billion spread over 40 to 50 years. If they can find that much money, it will be a very considerable cash injection into a science and poisons industry gravy train! “PFNZ” is now well entrenched as a concept and structure complete with a trust comprising notable figures from both the public and private conservation industry. Among them are Rob Fenwick, the chairman of the government science provider, Landcare Research, Kevin O’Connor of DoC, economist/businessman Gareth Morgan, William McCook of OSPRI, the former Animal Health Board, Fran Wilde, chair of Greater Wellington Regional Council, Charles Daugherty of the Ecology Department of Victoria University and several others. Until recently it is still being low keyed in its public profile and certainly evasive on eradication methods with airy claims of “blue sky” technology and self re-setting traps. Never mention poison! What is missing in the new trust are the originators of pfnz. We know that Jansen has had a job as a special adviser to the Minister of Conservation, but Kelly seems to have dropped out of the picture. As pfnz is potentially one of the world’s greatest gravy trains, it invites the question why. One clue to his fate is on a web site he set up,http://www.predatorfreenz.com/; where he states his opposition to aerial 1080. As aerial 1080 is the honey pot in New Zealand’s conservation, his presence would probably not have rested easily with the rest of the trust. There are currently several projects in progress with all the hallmarks of pfnz involvement, they include trust member Gareth Morgan’s “million dollar mouse” project to aerially spread tonnes of mouse sized baits of brodifacoum rat poison on the sub-Antarctic Antipodes Island. Another is a public-private partnership with wealthy philanthropists, Neil and Annette Plowman, titled “project Janszoon”, for a 30 year programme of aerial poisoning with 1080 and aerial weed spraying to supposedly return the Abel Tasman National Park to the state it was in when Tasman called in 1642. Stewart Island will be the first mainland site to have total eradication. For Stewart Island, the methods proposed are vague, but on the information available it seems it will have will have aerial drops of the environmentally persistent brodifacoum rat poison, the same as was done on the nearby Muttonbird (Titi) Islands. All information to date on the conduct of the pfnz campaign is couched in military terms, with operations starting from the south and spreading north in sweeps over the nation. It seems reminiscent of Captain Yerex’s futile campaigns against deer in the 1930s. Yerex’s campaign failed because he could not stop animals going back through the lines and into the freshly “cleared’ areas. In a radio interview on the morning programme of Radio New Zealand shortly before his death Paul Callaghan expounded his “vision” of how pfnz would work. The plan, he claimed, would be to set up fenced protected islands, almost arks which had been cleansed of “pests”. Here collections of “iconic” native birds would then be kept, without the flighted ones flying out – hopefully. At this point, the pfnz juggernaut would proceed from the bottom of the South Island to the top of the North over the period of some years, destroying every non-nativecreature not held behind wire for the purposes of agriculture. At this point there seems to be a tacit admission that every native species not protected in a fenced sanctuary will also have been destroyed. At the end of the campaign the doors of the sanctuaries will be opened and New Zealand’s “iconic” native birds can re-populate, albeit with a reduced gene pool a poisoned land devoid of ecosystems. What I find amazing about all this is that supposedly sane, allegedly clever people can buy into such a lunatic scheme. Not only will it cost around $27 billion and generate a groundswell of public opposition, but on the basis of the many failures of island eradications on simple uninhabited islands like Birnie in the Kiribatis, Henderson south of Pitcairn (see chapter 6) and Desechio, the prospects for the success of pfnz look hopeless. So far all the activity has been round the edges and pfnz has not yet moved onto large populated areas. Despite a Dominion Post of 24/3/13 three page special on Les Kelly and pfnz, it does not seem to have caused any major public concern so far. However, the paper article did see public opposition as a likely event, primarily they thought from suburbanites, organic life stylers and hippies. An even more myopic view is expressed in a thesis by a masters student under the supervision of Island Eradication proponent, James Russell. It offers the opinion that opposition will be only from a small group of anti-1080 activists. James Russell also stated that pfnz will require the endorsement of the overwhelming majority of New Zealanders (Dominion Post 20/3/13). This ignores the fact that, once such a large and potentially disruptive programme gets underway, it could well create considerable antipathy. Already we have seen pfnz trustee Gareth Morgan waging war on cat ownership, so ensuring that the nation’s cat lovers will not support anything he advocates. It is likely that, as the wider population begin to understand the extent and the disruption of pfnz and the consequences for them, there will be further controversy. It will only take a few pictures of innocent pet dogs and other animals suffering the excruciating deaths of 1080 poisoning for any support to swing away from the programme. Already there is considerable disquiet amongst many rural dwellers about current DoC and Tb Free “pest” control and use of toxins. When the size and magnitude of a programme like pfnz, the policing of pest control, and the access that will be required to be given to rural properties, it is a likely that recalcitrant element will arise which will seek to actively work against pfnz. Transfer that to the mainland, and you can get some idea of the magnitude of the task. Rats are ubiquitous. Wherever humans are, all over the world, there are rats. Even the first Maori settlers brought rats. If we eliminate rats, how do we prevent re-infestation? Tighter border controls; monitoring every vessel right down to fishing boats that arrive at these shores. This ignores “irregular” arrivals”, say a foreign fishing boat wrecking in a storm and rats getting ashore, if indeed when this happens, the whole $27 billion dollar exercise will be for nought. In the later part of 2014 “pfnz” went public with big promotions and opinion pieces in the major dailies, even articles in praise of Callaghan and the Royal Society from Rod Oram, the financial correspondent in the Sunday Star Times of 30/11/14. There was also an extremely lop sided television presentation that can be seen onhttp://www.tv3.co.nz/tabid/3692/MCat/3304/Default.aspxfeaturing a Department of Conservation officer extolling the necessity of aerial 1080 to save endangered birds and wildlife.Not only has pfnz gone public, but it is now spawning other public/private models. Next Foundation is made up of senior figures from New Zealand education and industry, and includes the almost ubiquitous Rob Fenwick. Among their goals, they claim:- “The Next Foundation has been established with a vision “to create a legacy of environmental and educational excellence for the benefit of future generations of New Zealanders”. The Next Foundation have joined with DoC and father and son businessmen, Gareth and Sam Morgan to form ZIP Ltd whose aim is “zero invasive predators”. All this is being accompanied by a more intensive publicity campaign, such as a “feature” article in the New Yorker of 22 /12/14 titled “The Big Kill – New Zealand’s Crusade to Rid Itself of Mammals”; it is little more than an infomercial for New Zealand’s conservation industry. Looking at it, it seems more than just an image polishing exercise; could it also be part of a sales pitch for wider PPP (public private profiteering) eradication programmes eleswhere, like that already planned for Lord Howe Island? Certainly Norfolk Island and some Hawaiian islands could be likely targets. “pfnz” is now on the road, and its success will not be measured by its ability to save birds, but in the money that can be directed into science establishments, academic institutions and the whole conservation industry. In fact, as it is so unlikely to succeed, it could continue forever, a cynical enhancement of New Zealand’s existing cost plus conservation industry. All of this ignores two simple and obvious truths. First, the likelihood of failure is so high, even on small and uninhabited islands. The 2011 “Aguila” expedition to poison three small islands only succeeded with one (chapter 6). A failure rate of 66%. For a much larger inhabited nation, success in ridding it of “predators” is just an expensive fantasy. The other truth is the simple and obvious evidence of Stewart Island and Te Urewera National Park: where there are no aerial poisoning operations, the native bird life is in good health. The case can certainly be made that it is not “pests” that are driving our native wildlife to extinction, but an unholy alliance of greed and zealotry. What if the Predator Free 2050 plan is actually a terrible idea? New Zealanders celebrated the government’s ambitious goal to completely eradicate possums, rats and stoats by 2050 – but according to some scientists, the plan is ill-conceived and unlikely to succeed. Ahead of a major conference on the future of New Zealand biodiversity, Dr Jamie Steer argues that Predator Free 2050 needs an urgent rethink. Last year the Government officially endorsed a plan so apparently uplifting and otherwordly it was compared to space travel – New Zealand’s very own Apollo mission. The plan is to completely eradicate five of our 31 species of introduced wild mammals, thereby eliminating some of the predators of our cherished native birds. The cost of the plan is estimated at over $30 billion. Once complete – some 35 years from now – we will be a Predator Free New Zealand. Well, sort of, but not really. To do this, the government assures us, we’ll simply need to “ramp up” the efforts we’ve taken to date to eliminate introduced predatory mammals from some 48 thousand hectares of remote, uninhabited islands. They figure we’ll achieve the same over the remaining 26 million hectares of towns, cities, parks and playgrounds with only moderate further difficulty. Oh, and we’ll also probably have to use a controversial, new and untested form of genetic engineering that drives our fellow not-originally-from-around-here mammal species extinct by making them infertile. The plan’s unveiling was a marvelous photo opportunity for the gaggle of ministers in attendance at the announcement; newspapers since have been filled with inspirational stories about the Predator Free New Zealand plan. We have all but fallen over ourselves to offer glowing recitations of the Government’s policies and to wax lyrical about “what if”. But a few others have remained more circumspect about a plan the late physicist Sir Paul Callaghan once called “ambitious”, but also “crazy”. They wonder at the lack of funding, the technical probability of success and, more disturbingly for its proponents, whether the plan plots the right course at all for conservation in this country. It all began, I explained, in the 1970s when a hippie sub-set of the baby boomers dreamt up an idea they called “ecological restoration”. History, they theorised, could be dialled back, and nature’s wonderful balance restored. The formula was simple: find an ecosystem, figure out the influences that could be ascribed to humans, and get rid of them. As the climate changed, as the world globalised, as thousands of people from around the world continued to migrate from the country, and as countless more species were introduced or self-dispersed, our role, it was said, was to keep our wildlife the same as it was hundreds of years ago. It didn’t come to much at first, but in the 1980s conservationists doubled down their efforts, targetting a subset of introduced wildlife they called “invasive species”. Conspicuous and unable to defend themselves, these species were to be ruthlessly scapegoated for the environmental mistakes of the past. Since then, New Zealanders have frequently been encouraged to kill invasive species wherever they find them. This is unfortunate because, generally speaking, broadscale control of invasive species has been a failed strategy in this country. We’ve barely been treading water in most areas. Even our most reviled invasive species – rats, stoats and possums – are still found in all but about 0.2% of their inhabitable range throughout New Zealand. In contrast, our conservation successes (and there have been many) have invariably been due to targetted, sustainable investments in small areas. Despite this fact, we’re still being conditioned to believe that there are no options. We either kill all these invasive species everywhere, or the native species that we love will all progressively die. It’s one or the other. But is it really that simple? Are our options really that depleted? I say no. In fact I reckon that an entirely valid alternative to Predator Free 2050, and the like, is to accept that some of our most vulnerable native species are not going to be able to survive everywhere in New Zealand. We might choose instead to accept that those species are going to be protected mainly on islands and in mainland sanctuaries, not that unlike the way they currently are. That’s not going to be the case for all our native wildlife mind, remembering that many of our native species – like pukeko, karoro and kãhu – are doing just fine on their own. More often than not they’re every bit as wily as their introduced counterparts. So it’s not going to be one or the other. Our future ecosystems are going to be mongrel, hybrid, mixed-up combinations of native and introduced. Globally, ecology and conservation movements are beginning to recognise this, moving away from fixating on pristine past states and historic species assemblages. Instead the focus is shifting toward urban and landscape ecology, and ‘novel ecosystems’, comprising mixes of species that have never existed in evolutionary history. Last year the Ecological Society of America, the world largest group of ecologists, themed their entire conference around life in the “Anthropocene” and how we need to get better at accepting and living within a dynamic, human-influenced nature. It has come very late in the piece, but some of us are beginning to realise that the ecosystems of the past cannot represent those of the future on anything more than a token level. We have changed our environment, for better and worse, to the extent that there is no going back now. A resilient future for life in our country now means adapting our lifestyles to the limits of the earth but also, and this is crucial, accepting that other species and ecosystems need to adapt now too. They’re not all just static museum dioramas for our gratification. We can still have a healthy, diverse, and productive biodiversity. But we can’t have the same biodiversity we had in the past: probably not even close, because that’s not how life works. Evolution is all one way. Not to a better life, but to a life best adapted for what’s in front of it. This, of course, is all lost on those conservationists who remain committed to the notion that the influences we have on our environments are all wrong. For them, the best we can do is to try to make nature more like it was in the past, before we inconsiderately came along. Don’t believe it. The fact of the matter is we have a range of environmental futures open to us now beyond replicating the past and it’s time we started genuinely discussing and exploring them. Let’s question the assumption that going in reverse is the only way forward for conservation in this country. Dr Jamie Steer has worked and studied in the environmental services industry in New Zealand for close to 20 years. He is passionate about promoting debate on the future of biodiversity management in New Zealand. Is this what FNDC calls Transparency? Sent: Wednesday, 9 August 2017 10:35 a.m.
since we have learnt from the media, that you, as the representative of FNDC have voted in favour of NCMSG’s ideas at the LGNZ Conference in July of this year, we have been wondering which reasons had prompted you to make such serious decision which will affect the lives of many pets and their caring families in the Far North. We are especially wondering about your motives because your specific vote was very important, considering the extremely narrow result of 51:49 votes and the fact that our neighbouring Whangarei District Council had obviously come to completely contrary conclusions and have voted against the proposal. Although you are probably familiar with their reasoning, we take the liberty to remind you that the large majority of WDC councillors expressed concerns over the difficulty in managing and administering the issue and the huge costs to the ratepayers, whether it would become a companion cat versus feral cat situation (here it must be added that there is a distinct difference between feral and stray cats, the latter very often being companion cats; for more information see Animal Welfare Act) and who would be responsible and liable for cats dumped on their properties, or that cats are critical to a lot of people, especially elderly ones, notwithstanding other doubts and uncertainties, mainly related to scientific evidence. In September 2016 NCMSG has promised all interested groups (us included), consultation on the topic and collaboration. We, like so many others, submitted our thoughts, worries and suggestions. Have they been made accessible to you? In order to make a truly informed decision? Have you read at least one of many submissions? And if so, which one? Ours, the one from your own district, maybe? We doubt that, as we have never received any feedback, not to mention the promised offer to collaborate with the decision makers.. Could it be, that you in your capacity as our delegate from the Far North represented just a personal view, impaired by partial information rather than one reflecting the majority of our elected representatives? Was your decision really sound and prudent? Have you before communicated with your community openly? Did you in fact think “outside the box”, as you say, when you accepted an old fashioned opinion of people who argue for biased and scientifically untenable claims? Northland Cats in Balance, our group of people who actually want “to change the way we think and the way we do things” disagree with this 51:49 vote you are jointly responsible for and we ask you to listen to our argumentation, because we believe that it is never too late to make corrections, especially if there is still time like in our case when FNDC are planning to have the new Bylaw about cat management pass in 2018/2019. We want to talk to you, each Councillor personally and also with the Mayor. Yes, please, let’s make decisions, as you also say, that show respect for the environment and the way we utilize and care for it. Without poison, without destroying self-regulating ecological patterns, but with a true understanding how nature really keeps its balance. And let us not forget that when a cat has killed 10 rats, she has saved the lives of hundreds of birds! thank you for taking the time to write. I am happy to meet with you to discuss, how does next Wednesday, 30th in the morning in Paihia suit you? which have been the reasons for your vote, considering the numerous and important counterarguments like e.g. scientifically proven facts? Have you consulted interested and well informed groups of the public who know what they are talking about before you voted? As far as we know, there has been no informed debate or exchange of views on this topic within FNDC before your vote at the LGNZ conference. Is this true? Does this also apply to the four other remits at the conference which passed with disproportionately clearer results? Have submissions on the NCMSG’s matter been made accessible to you? Have you read our submission, the only one from the Far North District before you voted? Did you know about the consequences which the recommended measures like cat curfews, compulsory micro chipping, cat rangers and changes to the Animal Welfare Act would actually have on a natural balance? I look forward to your reply. Would you please also let me know where in Paihia it would suit you to meet me? Great, how about we meet at the Library at 10am. I will discuss your questions when we meet in person. Please confirm that the above is suitable. unfortunately it will not be sufficient to discuss our questions when we meet in person. I am only the representative of our group and we all want to know your answers before the meeting in order to make the necessary preparations by giving them appropriate and careful deliberations. Moreover, we haven’t had the best experience in the past when we had “personal discussions” with Council members. Too much suddenly became “forgotten” or “wasn’t meant that way”. I am sure you’ll understand. Yes, I am happy to meet you at the library at 10:00, Wednesday next week. Thank you. Klaus, I appreciate the concerns you have raised. I should have been clear that I am happy to meet on an informal basis, i.e. Tania McInnes meeting with your group. This is not a Council meeting. I will leave the ball in your court if you wish to proceed. yes, I wish to proceed with even an informal meeting, as you put it, but independent of this we request from you answers to our questions in writing, just according to the regulations of the Information Act. When you say that (quote): “ I will discuss your questions when we meet in person.” (unquote) then there shouldn’t be any reason why you cannot answer them in writing as well. This is plain logic, isn’t it? I won’t be putting my response in writing. Happy to chat. we request your answers to our questions in writing, and this information is requested under the “Local Government Official Information and Meetings Act”. Furthermore we do not consider the meeting next Wednesday with you as “a chat” but as an informative, official meeting with you in your capacity as Deputy Mayor. Please confirm. In order to prepare yourself for the meeting we attach a copy of the summary of our submission to NCMSG and LGNZ. I look forward to receiving the requested information within 20 working days, counting from today, 25/08/2017. Noting your LGOIMA request, I have cc’d our CEO to formally respond and process. My offer to meet and have an informal discussion is now withdrawn. • Conducting their business in a clear, transparent and democratically accountable way. • Operating in an efficient and effective manner. • Making themselves aware of and having regard to the views of all their communities. • Taking account of the diversity of their community’s interests, both current and future. Is there a real danger of bias on the part of the member of the decision-making body, in the sense that he or she might unfairly regard with favour (or disfavour) the case of a party to the issue under consideration? The question is not limited to actual bias, but relates to the appearance or possibility of bias reflecting the principle that justice should not only be done, but should be seen to be done. Whether or not members believe they are not biased is irrelevant. PUSHING PAIHIA: Focus Paihia interim trustees are, from left: Jack Poutsma, Heinz Marti and Geoff Williams, general manager Tania McInnes, Grant Harnish and Rick Codlin. “This is the beginning of significant times for Paihia,” says interim general manager Tania McInnes. Grant, the current Chair of the Trust, has been involved with Focus Paihia since its conception in 2009. He is an owner of Salt Air in Paihia. 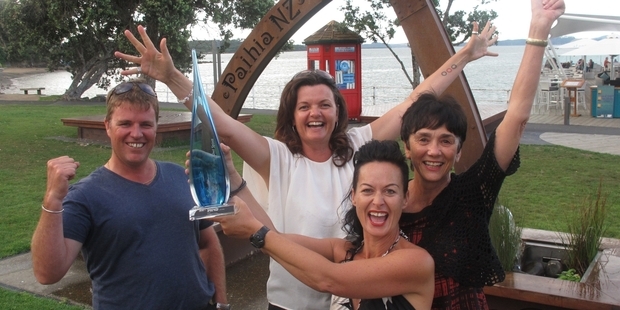 Grant is committed to helping Paihia reach its potential with the support of the community. lives in Paihia. Craig is also a trustee and volunteer trapper and coordinator on Bay Bush Action Trust. BBA calls itself a biodiversity protection group operating on around 250-300 hectares behind Paihia. Craig believes to have an excellent understanding of environmental issues and is, as he says, passionate about carbon reduction (? ?, apparently his “excellent understanding of environmental issues” has difficulties with basic principles of science) and pest control and biodiversity protection. The Focus Paihia Community Trust Board warmly welcomed Craig to the Board. No, Tania McInnes, we, the ratepayers and residents of the Far North District don’t need political ethics based on sentiments but rather on facts and responsibility for our communities. And what do BBA say on their own website about the former Paihia Cat Colony? “With the support of the Department of Conservation, Forest and Bird, Northland Regional Council and locals, Bay Bush Action worked hard to get a wild cat colony cleaned up in a Paihia town Williams reserve. FNDC trapped only two cats. One of them turned out to be a companion cat, caught by mistake, and SPCA “lost” the other one in Kerikeri. All remaining colony cats are now scattered and probably starving…. None of them found a loving home. Are these the types of self-appointed conservationists we all are dealing with? Who would align themselves to sadistic acts like this? Apparently our Council and Deputy Mayor. like a wild Cat if anyone else arrives. efficient to have a gas chamber in every town. This is exactly why we do not use cage traps when dealing with the strays and lost Cats who are present here. No, trapping a Cat is not the best way to begin with the socialisation process. mishandled by people who have zero Cat handling skills. compared to the entire population, but they are very active. media is only covering the antifelinist’s position. And what is the best teacher? Somebody who teaches in an entertaining, vivid and confident way, being curious about the outcome. If this is true, Mambo was a perfect instructor. For more than six years he taught kids at Paihia Primary School in the Bay of Islands and everybody loved him there. He lived three sections away from the school with his guardian. Yes, with his guardian, because, you see, Mambo was a cat – a very clever cat. Every morning he used to walk purposefully over to the school where he waited on the office doorstep to greet the caretaker when he arrived. Then Mambo went to the playground or classrooms to be with the pupils who already waited for his company. Later, during morning tea time, he was seated on a chair reserved for him in the staff room, together with all the other teachers discussing their efforts to impart knowledge to the kids. One day Mambo’s guardian went over to the school to apologize to the Headmaster for the cat being there. But the experienced teacher assured her that there was no reason for an apology as he was happy to have the cat being there and that he was using Mambo to teach the kids “KINDNESS” to animals. So this was Mambo’s subject of instruction, and from then on his guardian would proudly go over to the school at close of day to pick him up. She is a small woman and he was a magnificent cat. It looked quite amusing, when petite Lady V. carried Mambo home in her arms and it had become a well-known sight in Paihia because she did this every day, convinced like Mambo himself that he had done a good and important job. Assuming that, they were right of course, since what else could be more significant for children than to learn what kindness means? Kindness to animals leads directly to kindness in general, ie. to people too. Wasn’t this also the dying message of Helen Kelly? Yes, it was “KINDNESS”. How true! Are we forgetting how to be kind? Is that why CRUELTY is on the increase? https://northlandcatsinbalance.com/ and add your signature. This is my experience with Micro-chipping: I bought a special Cat Flap which operates by my Cat being fitted with a micro-chip. Great idea ? Well, I thought so. Things went O.K. for a few months and then, suddenly, the cat-flap wouldn’t ‘Open’. I took my cat back to the Vet who had implanted the chip to check things out and the scanner could not find the CHIP. Apparently there had been a batch of FAULTY “chips” and the ‘Makers’ were providing a replacement Chip FREE of charge. However, had it not been for the failure of the Cat Flap,this could have gone unnoticed. What chance had my cat then if she had been COMPULSORY – CHIPPED and then had been found “straying” – with a FAULTY Micro-chip ? END OF CAT . CHICAGO—Nicolas Cuervo and his neighbors called, texted and pleaded. Finally, after over three months of waiting, their highly coveted order arrived: a crate of stray cats. “It was almost like getting a newborn,” said Mr. Cuervo, a 44-year-old copywriter, who had three cats from a street pack delivered to him last month. Now, Mr. Cuervo is waiting some more—to see if he can persuade the beasts to stick around. Hi folks! My name is Pipi. Yes, I know, it’s misleading in a way, but it has been given to me by somebody who really likes me and helped to save my life. Therefore I don’t scrutinize it too much, you see? Of course I know that the proper name of our family is Halcyons. Yes, like the birds of classical legend, said to magically calm the waves when they nested on the sea’s surface. But perhaps the primary meaning of this old word “alcyon” reflects what happened after my horrible fall from our home in a much better sense than just the term “pure luck”. In the Greek language at least it is a synonym for “bringing peace, happiness and joy”. Who knows ? and I leave it to you to decide. Well, however that may be, it all started with some wrangling between me and my brothers in our nest high up in a hollow tree overlooking Frenchman’s Swamp. We were fighting for the spot closest to the hole where our parents arrived with food, and the next thing I can remember was me being airborne! They had just pushed me over the edge and I was falling, falling and falling. I was only 25 days old and didn’t know much about flying. In fact, I have had my first lessons together with my brothers just six hours ago and couldn’t recall anything at all, if only because of being scared to death! But when I hit the ground the impact wasn’t too bad. Although I had landed roughly on a layer of casuarina needles, I had fortunately missed a large rock and nearby very ugly upward pointing wooden splinters of a broken Manuka. Phew! I rolled around and had a further look. In the pink light of dusk I could see through high tufts of grass a whole forest of tall trees surrounding the one which I had fallen from. Mum and Dad were circling above me, screaming nervously. All I understood was how worried they were because of the late hour and too little daylight left. They told me to stay put until dawn, when they would come back for a crash course in take-off and flying home. That’s what I did. I crouched down, made myself as invisible as possible and tried to become part of the terrain. When the sun had set, all the noises stopped at once for a short time as if everyone was holding their breaths in anticipation of the night. I felt very lonely. There was no wind at all and so I could hear the new sounds of darkness slowly increasing. From far away the first calls of owls and closer rustles in grass and dead leaves. I was frightened of those immediately. Who was behind them? Friends or enemies? I wanted to believe in friends with all my heart since the world hadn’t shown me its real character yet. Soon I should know better. It was much later when I woke up from a merciful sleep of exhaustion. The nearly full moon cast her silvery light through the tree branches, somehow enlarging all things. Perhaps this was the reason why this black wedge-like shape creeping through the next bundle of grass seemed much bigger than a rat would usually look like. Its glowing eyes were focussed on me and I became stiff with terror when suddenly all hell broke loose. Something a hundred times larger than the rat, so it seemed to me, threw itself towards the rodent, two mighty paws full of sickle-like claws seizing the body of the much smaller animal, and then I heard the scream. The terrible scream of a mortally wounded living being and it went right through me. Very slowly and cautiously the big killer’s head and mouth closed in on its prey. His fangs sparkled briefly in the moonlight before they sank into the neck of the rat. A sharp jerk followed, then silence and the killer straightened himself up to full height. It was a cat, and it was big. A big tabby, to be precise. Had he saved my life by any chance? For the time being yes. But when he suddenly noticed my presence, maybe because he had sensed my fear or smelled it, and when he looked at me from those huge indifferent eyes, I feared that there had been only a delay in my way to die. Very casually he touched me with one of his front paws and I fainted. It seemed ages later when I finally had regained consciousness, and I found myself in a dark space under a black ceiling right above my head which apparently rested on four short and bulgy pillars. Everything was completely quiet and I thought I was alone. But then it dawned on me, that two pairs of greenish gleaming eyes were watching me. From far away though, from beyond the dark space ,and they were motionless, but instinctively I knew to whom they belonged: to the big tabby and some other cat. That was when I started screaming. Do you know how this sounds? Kingfishers can shriek in a terrifying way, like perhaps much bigger birds of prey would cry, and I was surprised of the result. The cats’ eerie eyes disappeared at once, but above me two people were suddenly talking to each other and then one of them moved rapidly aside, putting his feet down on the floor where I was sitting. An instant later brilliant light flooded the bedroom. “It came from under the bed” a woman’s voice murmured drowsily and before I realized what happened, a big hand had grasped me. Today I am still wondering how my little heart could have borne all these horrifying events, but well, I am still alive! Thus my life was saved by a cat and the kindness of two human beings. No, that’s wrong. It was saved by a cat and three people: The third one is the good genius of Russell’s Bird Rescue. That’s why I am well again, why I am free and why I have learned how to fly. Soon I am going to have a wife and kids who I’ll take care of as best as I can, but in case something bad happened again, I’ll try to be very, very close to the Birds’ Fairy called Gill. This article from the New York Daily News shows how New York City called in the experts when the rats got out of control! Feral cats are being caught by volunteers from the NY Feral Cat Initiative, neutered and vaccinated, then sent to areas where they can keep rat populations down. Sometimes just their presence alone is enough to discourage rats from moving in.